Digital television requires significantly fewer measurement parameters to evaluate the quality of the transmitter output signal; Broadcasters and Network Operators are increasingly interested in knowing the real performance of terrestrial DTT networks, critical especially after the introduction of SFN transmission. The DGQoS DQM series of probes allows operators to accurately verify the quality of signals received in viewers' homes emulating the reception quality of settop boxes and TVset. DQM130 is the ideal probe to have a 24/7 control of the Quality of Service for DTT networks; very compact (just 1 RU 19”), it embeds DVB-T/ T2 (and very soon ISDB-Tb) demodulator and TS analyzer according to TR 101.290 (priority 1,2 and 3). 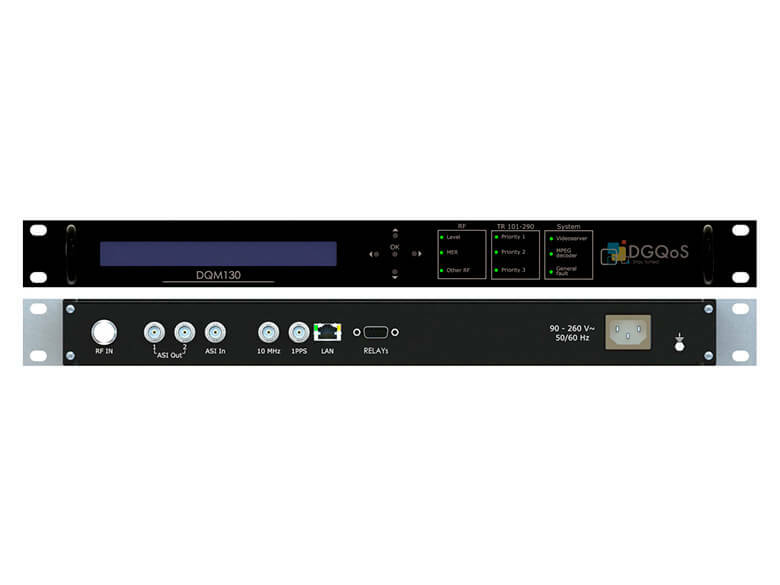 It accepts also ASI input (for distribution network equipment monitoring, such as microwave links, satellite receivers and fiber optic terminals) and, if equipped with internal MPEG-2/MPEG-4 HD decoder, provides confidence audio and video streaming, single service or full Transport Steam over IP. Even RF parameters, such as RF level, MER, constellation, echo pattern and MER(K), are continuously monitored, allowing operators to immediately identify problems in the transmission network, reducing black-out time. The DQM130 can be configured and monitored through local user interface (display/keypad) or remotely through web interface and SNMP (for integration with NMS). Data rate monitoring for each service and PID with long term and peak evaluation. Video and audio confidence streaming at low bitrate or entire service or TS over Ethernet. Sequencing mode with up to 16 user definable channels.